Dieter Dengler, a young American fighter pilot of German origins, is shot down over Laos, in 1965, just when the Vietnam war is about to start. Naïve and enthusiastic he doesn’t think that much harm could come his way but when he is captured by Vietcong he learns otherwise. Thanks to his astonishing resourcefulness, his unabashed optimism and his sense for camaraderie he survives the worst imaginable circumstances. He endures torture, hunger, pain and humiliations by sadistic guards, petty accusations and nagging by fellow prisoners. He carefully plans their escape and finally succeeds, only to find his ordeal is not over. Werner Herzog is known for movies that often have lush jungle vegetation as a backdrop. No difference here. The same cinematographic language that I knew from movies like Aguirre, Fitzcarraldo, Cobra Verde and Grizzly Man that have made Herzog famous. The beauty of the forest, the plants and giant insects are captured here as well, but then the comparison to other movies stops. 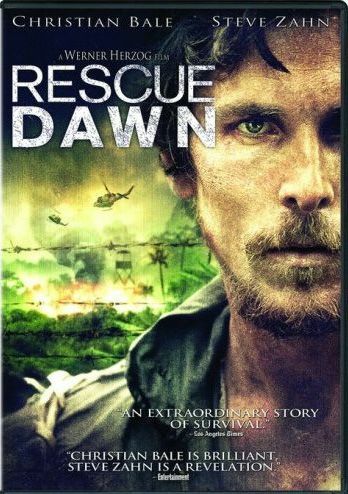 Rescue Dawn was one of the most revolting films I have ever seen. Probably it is shockingly true to the events that Dieter Dengler had to endure, nevertheless I found it hard to watch. Seeing people eat handfuls of larvae and maggots was not my cup of tea. Sure it is well done and all but yuk, yuk, yuk. Apart from being disgusted I am also awed. It´s incredible what some people can endure and how they manage to survive the worst. Christian Bale is very good although he acts quite badly at the beginning. Steve Zahn and Jeremy Davis are outstanding. Required viewing for Werner Herzog fans, POW movie fans and every one like me mad enough to think they have to see every decent war movie no matter what´s at stake for the stomach nerves. This entry was posted in Actors, Movie, POW, Trailer, Vietnam and tagged Christian Bale, Dieter Dengler, History, Jeremy Davies, Movie Trailer, Movies, POW, Rescue Dawn, Reviews, Steve Zahn, True Story, Vietnam War, War Movies, Werner Herzog. Regards for have trully very good informations. Your web site is great and i'm impressed. It shows how well you understand this subject. Bookmarked this specific web site. will come again for a lot more. Thanks a lot for the kind words. I really appreciate your comment. I really appreciate your work…. Thanks for sharing this movie. I am an die hard lover of war movies. I had forwarded this to all of my friends who are crazy of war movies. Keep it up…. Thank you once again for sharing this…. Thanks a lot for your comment. It’s good to know people like the site. Keeps me motivated.